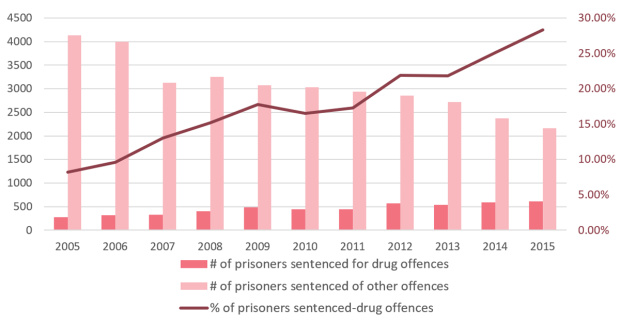 Imprisonment trends for drug-related offences tell us a rather compelling story about drug policy and its misguided reliance on repression. Recent research conducted by the Council of Europe shows considerably diverging patterns in imprisonment rates for drug offences in the region between 2005-2015. Countries such as Albania, Azerbaijan, Estonia, Lithuania, Russia and Turkey saw the highest increase in the proportion of people sentenced for drug offences among CoE member states over this period. In Estonia, this uptick was significant. People in prison serving sentences for drug offences went from 8.2% of the total prison population, in 2005, to 28.3% in 2015. These changes, however, are not surprising. Despite a growing consensus on the negative impact of criminalising people who use drugs, and a body of evidence that points to a disconnect between imprisonment and lower crime, a significant number of countries still struggle to rid themselves of a tough-on-crime approach to public security. In Estonia, legal reforms aimed to reduce the burden of criminality on people who use drugs, enacted in 2005, have had mixed results. The Narcotic Drugs and Psychotropic Substances and Precursors Act provides a framework for drug control in Estonia. The law states that unauthorised consumption or possession of narcotics or psychotropic substances in small quantities and without a prescription is subjected to a fine of up to 1,200 euros or detention for up to 30 days. What is more, any act of illegal possession [or supply] of drugs which is deemed not solely intended for personal use is considered a criminal offence, irrespective of the type and amount of illicit drugs. Thus, illegal manufacture, acquisition, theft or robbery, storage, transport or delivery of narcotic drugs with the intent to supply are punishable by up to three years’ imprisonment for the smallest quantities and by 6 to 20 years’ imprisonment or even life, depending on the quantities involved. 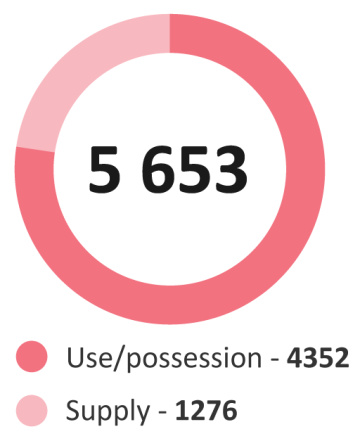 According to the latest data, almost 8 out of ten reported offences in Estonia were related to use and possession. Mart Kalvet, an activist representing LUNEST, a Estonian organisation of people who use drugs, offered a revealing explanation for these statistics. In an interview with Drugreporter, he argued that the drug laws in Estonia have changed so that the possession of an amount of any illicit drug smaller than “the amount needed to intoxicate ten or more people” is no longer considered a criminal offence. He states that this is an improvement because: “On one hand, it has actually made possible the emergence into the public consciousness of drug users rights advocacy sentiments, but, on the other hand, it discriminates heavily against chronic users of opioids and other drugs with a high addiction”. The lack of clarity and limitations of relatively subjective thresholds might be contributing to what experts call “net widening”, which means that an increased number of people who use drugs are in contact with the criminal justice system; particularly those in situations of increased vulnerability. In turn, this approach fuels vulnerabilities and exclusion through criminal convictions and an increased reluctance to be in touch with harm reduction and health services. It would be difficult not to see a correlation with the significant increase of drug-related deaths in Estonia. In contrast, countries such as Portugal, Switzerland and Spain reported a decrease in the percentage of prisoners sentenced for drug offences (and either stable or decreasing absolute numbers). Portugal decided to decriminalise the possession of drugs for personal use in 2001 and to adopt a radically different approach, one that prioritises public health. An increased number of harm reduction interventions were adopted, including needle and syringe programmes, drop-in centres/shelters and contact units. This new approach has led to a big positive impact in terms of reductions in deaths and harm in general. The HIV infection rates have dropped significantly from 104.2 new cases per million in 2000 to 4.2 cases per million in 2015. The number of deaths associated with drug-use have also decreased significantly from 80 in 2001 to 16 in 2012. This makes Portugal the country with the lowest rate of drug induced deaths in Western Europe. While challenges remain, Portugal can serve as a model in this case of what kind of approach should be adopted; one that focuses on decriminalising possession for personal use by emphasising public health and well-being. As a result, this can lead to shifting people’s attitudes regarding drug abuse and therefore making it is easier for drug users to seek the treatment, they need without being stigmatised. In Spain, unlike Portugal, decriminalisation has been a prominent feature of the legal system for decades. Subnational authorities and local activism have contributed to shape reform at the local level even without the assistance from the federal government. Their approach to drug policy based on harm reduction led to the expansion of opioid agonist treatment (OAT) and needle-and syringe programmes, which led to an improvement in health-related quality of life for people who use heroin. Studies showed that those who had access to OAT reported a noticeable improvement after only 30 days. Spain has also pioneered other harm reduction interventions, such as drug checking and safer consumption spaces. The latter provide people who use drugs with the opportunity to use drugs in a safe setting under medical supervision, with sterile equipment and the possibility of accessing other social and health support services. These spaces are supported by research, which shows they are linked with a decline in the rate of overdose deaths. Even though there is evidence that we are moving towards a less punitive approach to drug policy, with countries such as Portugal, Switzerland and Spain providing clear examples; there is still so much more to be done in terms of harm reduction interventions and the effectiveness of the current drug policies. The ‘tough on crime’ approach to drug policy has been proved, countless times, to be ineffective, leading to overcrowded prisons, severe punishments for minor infringements, and the incarceration of individuals who might need support, not a prison sentence. As long as politicians rely on generating a moral panic for ideological, electoral purposes, rather than basing policymaking on compassion and kindness, we will continue see devastating repercussions. * This blog post was produced within the framework of an 8-month volunteering experience placement at the International Drug Policy Consortium, organised by the Department of Law and Criminology of the University of Greenwich. The scheme offers students in their penultimate year of studies the opportunity to volunteer with public, private and third sector organisations that work with/in relation to the criminal justice system in order to develop skills and capacities applicable to work settings.